For many students, creative projects drive the most learning. The project pulls together their interests and skills with the material, and engagement happens. Projects make a huge difference in any curriculum. When I look back on my experience as a student, creative projects are the highlight of every year going all the way back to 4th grade (my leaf collection!). As a teacher, I try to build them into almost every unit. If you've been wanting to do more creative projects, but you're stuck for ways to get started, this post is for you. I'm going to share five different categories of projects to help you find inspiration. If you need a quick fix of project-based inspiration, I've created a printable checklist of thirty-two project ideas within these five categories. Print it out and put it by your computer and it'll be a LONG time before you run out of ideas! Subscribe below and I'll send it right along. My school once got rid of sophomore honors English and history. Students could pursue the honors distinction by completing a portfolio of interdisciplinary projects instead. 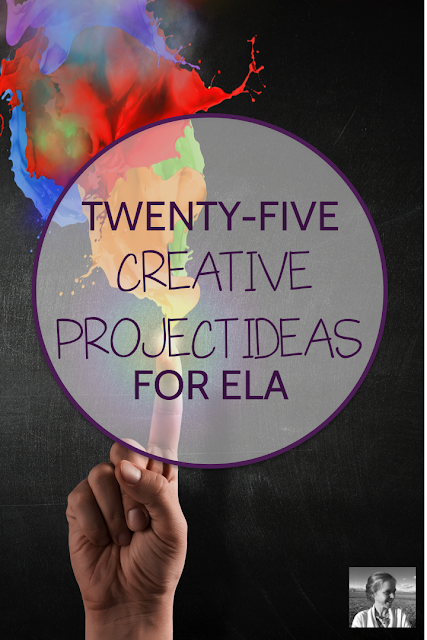 Our teaching team needed to invent these projects and roll them out every couple of months. Our first was to have the students do a radio show like This American Life. They chose themes related to our curriculum, each recording an introduction, interviews, stories, and a conclusion. Then they mixed all this with music to produce a podcast. The results were phenomenal. There are many more ways you could use podcasts. 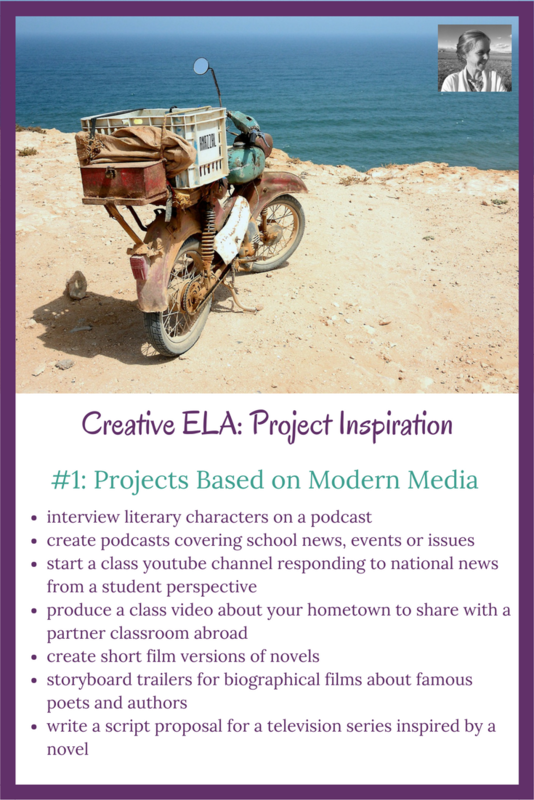 Students in groups could create a podcast in which they interview guests who are characters from a novel. You could have students go out and interview people in the real world about topics they care about. 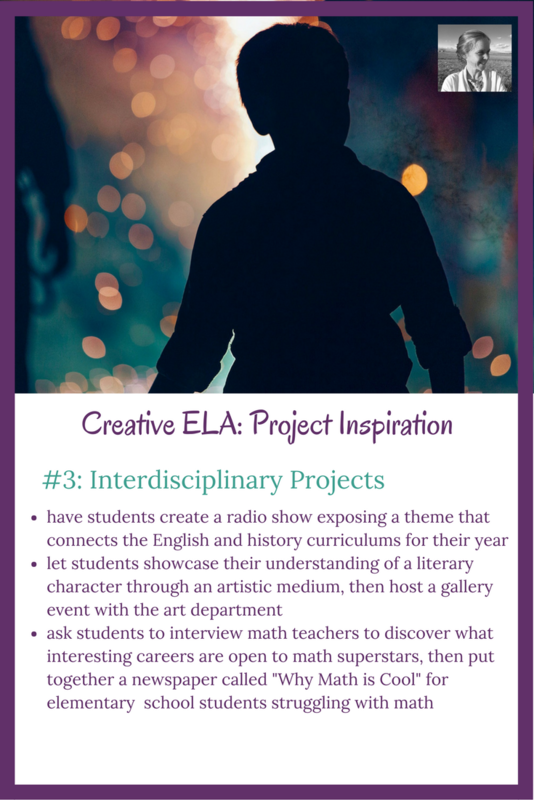 You could come up with an interdisciplinary task, like creating a podcast about the school robotics team or maker space, featuring information, background and interviews that allow students to dive into STEM topics through humanities skills. Another great way to use modern media as the basis of a project is through video creation. You could start a class Youtube channel covering modern news from the student perspective, then let students create videos every couple of months on a major recent happening. The videos should include commentary, interviews, and related storytelling. Ask students to create two minute versions of the novel you are reading, either through cartoon animation or short acted scenes. Participate in a collaborative project with students in another country, producing a video as a class that explores your city and its people and sharing it with your partners, then responding to theirs. Perhaps your students would enjoy drawing up storyboards for the Netflix version of your latest novel. Or writing a television series proposal they might present to PBS. You get the idea. Once you're rolling, there are hundreds of ways students could explore material with real depth through the medium of modern media. Who doesn't love it when their hard work is truly celebrated? There are many ways to create a festival-based final project. Have students present creative free choice reading projects at a reading festival. Invite younger students who could use inspiration in their reading choices. Play music. Have food. 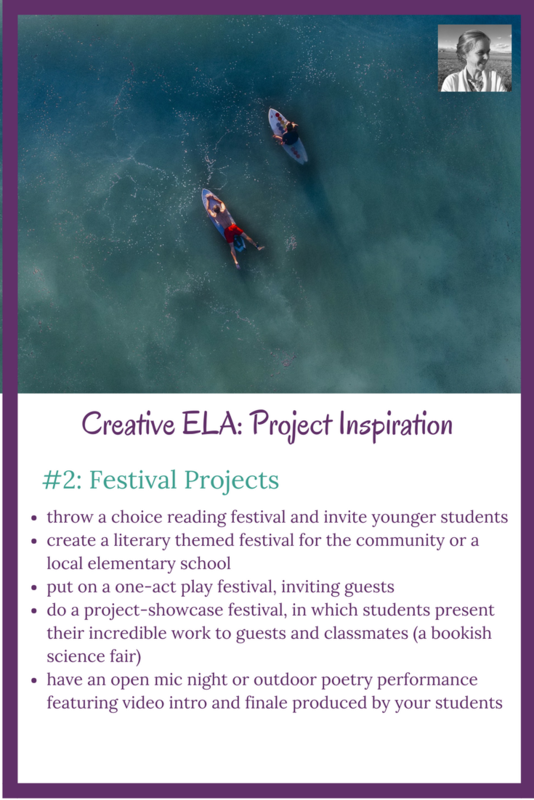 It doesn't take much preparation to pull off an engaging festival for your students. Let them help; they'll buy in more and it'll be less work for you. Or make the creation of the festival itself the project. Maybe you'd like to do a transcendentalism festival for a local elementary school. Have students in groups plan activities, make food, create posters, postcards, and booklets to share with the younger kids. Put a pair of students in charge of leading a nature hike and another pair in charge of contacting local news media with a press kit and follow-up materials from the festival itself. Revel in the joy success will bring your students. When students have created something outstanding, a festival can simply be a way for them to showcase their work. Say, for example, you've had your students create innovative apps designed to solve the problems of literary characters (one of my own favorite projects). Let them present the apps at a class innovation fair, similar to a science fair but with a bookish flavor. Either have students take it in turns to wander or answer questions in front of their displays, or give everyone two minutes with the smart board behind them to present their apps as videos, Prezis, Powerpoints, or powerful speeches. Thinking about ways to give students an authentic audience and a memorable day amps up engagement so much. I find that festivals get everyone excited, every time. The world is getting more interdisciplinary all the time. If a student wants to be known for great cooking, it's a good idea for him to be able to take good photos, make videos, write blog posts and run social media if he hopes to write a cookbook someday. Entrepreneurs must be good not only at whatever they hope to build a business around but also at all things media and marketing. Athletes must manage their personal brands and communicate with the news. Historians better be ready to broadcast live for their museum's Facebook page. Providing students with ways to mix and match what they are passionate about from multiple disciplines sets them up to be happier later on. Let's imagine a project or two you could do with colleagues in several departments at your school. Art: Ask an art teacher if he or she would consider hosting a gallery show in your school's display area with work from your students. 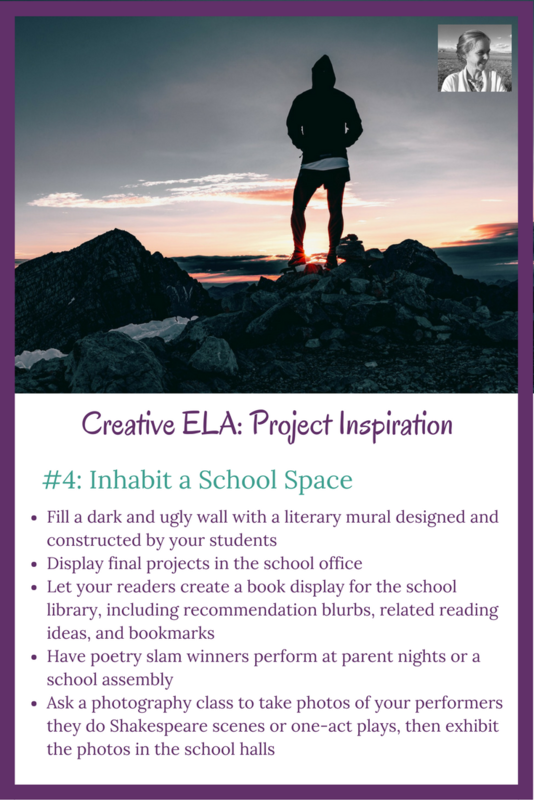 Then bring the art teacher in as a guest speaker as you introduce a project to represent the nature of one character from a novel through an artistic medium. Imagine a gallery featuring short videos, paintings, drawings, photo essays, murals, and sculptures expressing the nature of Hester Prynne from The Scarlet Letter or Puck from A Midsummer Night's Dream. Have students write up reflective analysis papers demonstrating how their work represents their careful character analysis, and display these to accompany the art. History: Talk to a history teacher about some of the important themes of the history curriculum in the year you teach. Choose one major theme and share it with students. Have students begin hunting for news articles, headlines, and images from modern media that connect current events and trends with this powerful theme from their history study. Get permission to create a giant collage somewhere in your school space. Have every student write a paper connecting ten things they find on the wall to the theme, and choose the best to publish and display by the collage for the whole school to read. Math: Ask students to interview math faculty about exciting math-based careers. Then have them create a newspaper called "Why Math is Cool" to publish and share with younger kids who find math a struggle. Send them out in pairs to research the topics and create elements of the newspaper - comic strips, columns, infographics, articles, advice columns, etc. When you do an interdisciplinary project, you not only engage your students but you understand them better as students. More interdisciplinary connections may naturally arise, and your newly strengthened relationship with your colleague in another department can only help. Again, this project provides that all-important piece, the authentic audience. When students know they will be creating a project that many people will see, it makes a big difference to their motivation. Perhaps your students could exhibit final projects in the school office. Perhaps the culmination of a free choice reading unit could be the creation of a huge book display with recommendation blurbs in the library. Maybe poetry slam winners could perform as part of a school assembly or at a parent night. Or a photography class could shoot photos of your class performance of Death of a Salesman to display in the entryway of the school. Is there a dark ugly wall somewhere in your building waiting to be filled with a collage of great literary quotations? Or a mural featuring three important themes from great American novels? Inhabiting a school space connects your classroom to the community and the community to your classroom. If authentic audience is king, competition is queen. Both have great power for motivation, like it or not. Engaging students in the writing process by taking part in a challenge or participating in a competition is an easy win. 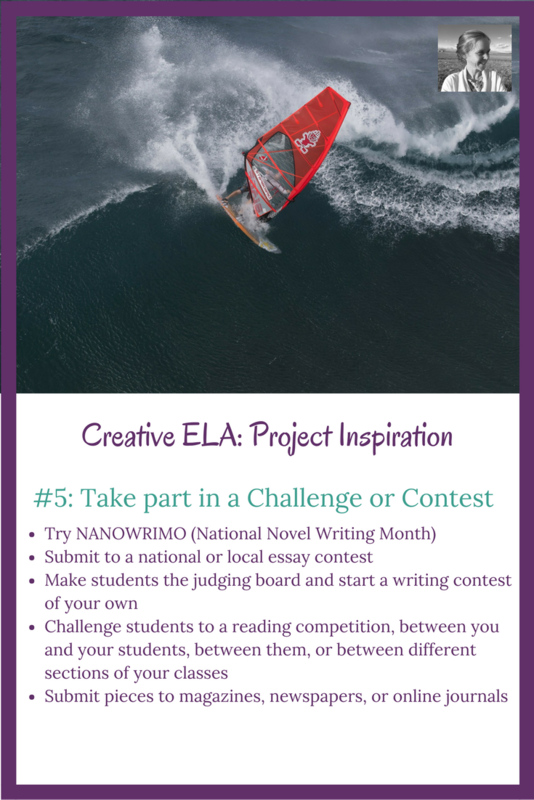 Why not try NANOWRIMO (National Novel Writing Month) with your students this year? Can you imagine the feeling of accomplishment that would come with writing a novel as a teenager? Or build a unit around submitting to a national essay contest (here's a list of great ones) or one in your community. You could even start a youth writing contest in your city and make your students the judges. What a lesson in good writing it would be to create a rubric and discuss the finalists to determine what pieces are the best! Similarly, you could start a website to publish student writing and make your students the editors and the public relations managers. I hope you've found some inspiration for your next project. To borrow a line from Pringles chips, "once you start, you can't stop!" I'd love to hear your plans in our fabulous Facebook group, Creative High School English. See you there!